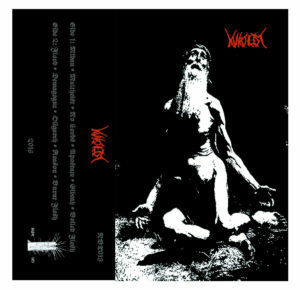 I am actually getting sort of mad at the West Coast for having such a gnarly scene of disgusting black and death metal. Out of left field comes another act with little information a loud bite. Where are all of these bands coming from? Do they all Maltheist is from Portland Oregon and their 11 track demo has the consistency of gasoline igniting in a glass bottle. What is interesting about Malthiest is the lyrics as the band’s written approach to music mirrors their musical endeavors. With a fusion of death metal and grindcore, Malthiest splits the difference between social, metaphysical, and atmospheric themes in a record that sounds like grind that was lost in the desert for years and now has come back with wild eyes and a prophecy. With lyrics like A fool’s ascension / Hoisted up by a hateful mob / A laughing stock / Inarticulate demagogue / Our country’s downfall / Decimation of a generation / We’ve found our Nero / Burn it down and start again gives distance for lyrics to settle while not immediately dating the material. Maltheist’s resentment runs deep within their first demo but it maybe a type of emotion that has been charted throughout humankind. The chaos which lies at the foundation of this demo is spat through broken teeth and clenched jaws. The vocals dip over louder guitar riffs and while I am usually not swayed by minute long tracks but Malthiest seems to have purpose rather than flippancy for conventions. The echoing vocals over the music is both revolting and inspiring. There is anger within this music but it transcends momentary emotions and is cast in stone as statues venerating human tragedies.